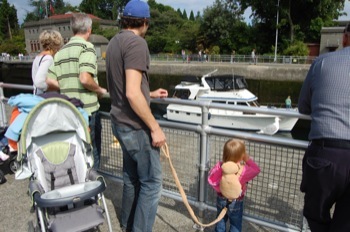 We watched the boats and salmon at Ballard Locks . Macey got to try out her leash too, which worked liked a dream for a girl who is constantly running. 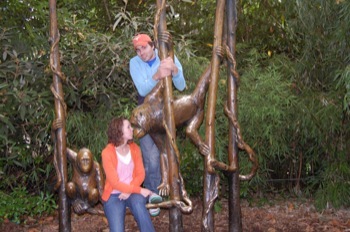 It was quite cold in the morning at Woodland Park Zoo, but luckily it warmed up. Macey loved all the animals and you could tell which ones were her favorite because she would cry when it was time to move on. 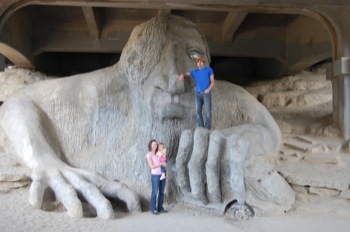 We found the Fremont Troll. It was pretty crazy how it's just right there on the side of the road. Macey was roaring at him. 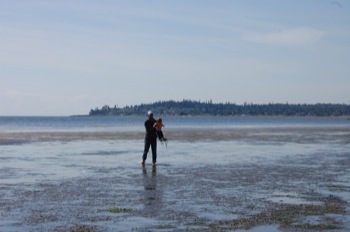 Macey loved Birch Bay! She was running everywhere getting extremely wet and dirty. Here's Paul catching her after one of the many times she ran away. If you look close you can see all the seaweed hanging off her shoes. 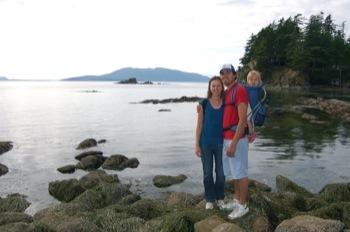 Paul had never been to Larrabee State Park in Bellingham. So we hiked around the rocks there and Grandpa found Macey lots of crabs to look at. 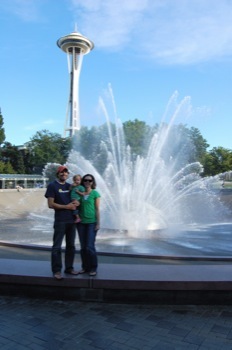 On our way out of town we stopped at Seattle Center. Once Macey spotted that fountain she wanted to get as close as she could. It was very sad to fly back into Salt Lake and see all the brown, I just don't think I'll ever get over how beautiful it is in the Northwest. The trip was a success though, because Paul admitted how much he loved Bellingham and how he wouldn't mind living there (someday). Check out our Family Website for a photo gallery. i love macey's leash. i mean backpack. i mean stuffed animal. I love the leash. story time: my friend had to go to her church meeting that night and was just complaining to her husband that she never gets to weed the garden cause her little girl was always bolting. she came home and all the weeds? GONE. she asked how he did it, his reply? : "easy I just tied her to the tree, dont worry she had a 3 foot radius." HA, so there ya go, just tie macey to a tree. also, bellingham is probably the most beautiful place on earth, i think everyone that lives there needs to move away to either southern Idaho or Utah so they can really appreciate the wonderfulness. Wow what a great vacation, it looks like you had tons of fun. I wish we could have gotten our kids together and visit, Macey is getting so big...maybe next time! I always make fun of people with their kids on leashes but I guess it's better than running after crazy kids!! By the way will you be coming out for Christmas? Oh and thanks for the "chasing cheerios" website, I love it! Sounds like a great time! How did the activity bags work?